Our daughter’s First Holy Communion was this Saturday, and it was a wonderful gathering to celebrate our baby girl; which I still can’t believe happened. It seems like yesterday we just celebrated our oldest daughter’s communion, but it was two years ago in fact! Yeesh! Saturday we luckily woke up to bright sunny skies, and I jumped out of bed to dress the backyard, transforming it into a garden party. Very similar to the one we threw for our oldest daughter since I kept a lot of the same accessories. The weather of the morning was warm, and it was the perfect way to begin this day. The whole morning meshed well, and the last-minute details went up without a flaw. Phew, what a relief! Soon after showering, and letting our kids relax around the house, my parents and sister, with her family, arrived to drop off some amazing homemade desserts and apps, and for my sister, my daughter’s godmother, to present her with a gift. She gave her a sweet cross bracelet that my daughter can enjoy and wear for years to come, always thinking of her favorite Zia (=aunt). We arrived at the church very early, as the communicants had to be there to assemble in the hall downstairs from the church. Our daughter was one of the first, so she got to take some professional photos early on and chill out waiting for her classmates to show up. She wasn’t nervous or anything, which I was expecting otherwise. The church was decorated all in white, with white floral arrangements adorning the altar, and the sun shining in perfectly through the stained glass windows. So pretty.. I really love the look of my church, which I have mentioned before. It is just so beautiful and feels like home. The ceremony began, and the children all filed in along the outer aisles of the pews where their artwork was hanging for all of us to see. There were those nerves I was expecting. hah She looked so beautiful in her dress and veil, and she kept giving me the eye to stop making faces at her. She sat down with us and we got to enjoy the services together. The whole mass and ceremony felt like it was enjoyable and we got to witness our baby girl take her second sacrament. My oldest sister is always with us. This is my sister’s patron saint, namesake,. And here with her other. And thanks to my bff, he was walking his son, and got to take this shot. The only post communion shot we took as a family! Soon after the ceremony was over, we got a call that our catering was EARLY and waiting at the house. So we shot one family photo and dashed to the house…this is when the weather decided to cool down a lot, so you will notice the photos of us go from dressed up to sweatshirts quite fast! ha oh well. Now… Let’s talk the whole shindig!! 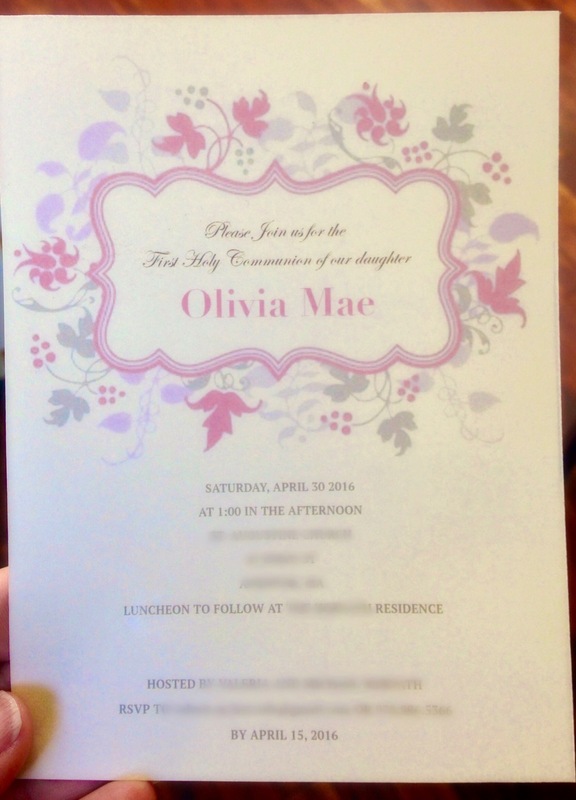 We went with a shabby chic designed invitation which was a perfect match to the garden party theme. Her dress was so pretty, and the photos just don’t capture it right. The dress was a satin a-line with the top smocking detail of organza, flanked by tiny daisy rhinestone details that sparkled. She wore the identical shoes of her sister, but in her size, and the same gloves and tiara. She looked like a doll really. So, I am Italian right? I think. ha. Well, the party favors are a big deal for us, as I mentioned here. This time, however, I did not make the confetti that topped the favors, but had them made. I then purchased frames, placed a cute photo of her in them, wrapped it all in pink and glued the confetti on top. The frame is a white version of the one we gave away at our oldest daughter’s party. The favors…a vintage type frame with her cute picture in it. For the cake, I had mashed a few of my wants into this design. It’s a shabby chic take on an elegant rose inspired cake. It’s a two tiered cake that was frosted with whipped cream and decorated with roses all along the second tier, and a mass of roses topping the topper. Since the weather changed so much, we ended up inside for dessert..I changed out the cloth to a sequins one, and placed all the goodies on top. Yum! Glued on lace, pink ribbon and cute satin flowers. For this party, I used a lot of the same elements from our oldest daughter’s party. I just had to because for one I already owned them and spent a lot of cash on the stuff, and two I loved how it looked and wanted to make it happen again. So a shabby chic garden party it was going to be…again! This time around though, to change it up, I used the color pink to accent around. This is our daughter’s favorite color and it was an easy way to make the feel of this party different from the other. The appetizer table: Inside the house I had draped the kitchen table in a shantung pink table cloth. The table was then set with a large slab of marble, which was dressed with salumeria/cheeses, fruit, chips, balsamic onions and olives. Across from the table I had set up a wine bar stocked with chilled white wine and reds, and shiny glasses. The dining tables: We rented white table clothes, and topped them with my burlap squares as the center runners. On top of each table, as centerpieces, I used lace laser cut pink planters from Ikea; that I had bought months ago for a super great steal at $3.99 each! Then inside of each container I placed three 4.5″ pots of very special, locally sourced “Colleen Ritzer daisies” ($7 each) from Konjoian’s Greenhouses. These daisies were cultivated by The Ritzer family on behalf of their daughter, and the foundation they created in her honor. The daisies matched the containers perfectly, and with this purchase I feel like I did my quarterly part to give back to a cause. (I try to donate every quarter, either towards St Jude, Dana Farber/Breast Cancer research or a cause one of my friends are participating in if it hits at the right time.) Ok back to this day. Collage of photos.. she was the cutest! my husband, who helped me a lot for this party to be successful! The kids hung out all night long, it was so sweet. Well, that is all I have for pics between myself, my sister and friends. I didn’t go all “Valeria crazy” taking them because the time just kept escaping me between prepping and breaking down stuff..and drinking wine haha; so I missed out on a lot of formal pictures, but we enjoyed every minute and hope it shows! Now who’s going to heat up some arancini for me! ?